Does Helaman 13–16 Plagiarize View of the Hebrews? A popular, if not highly imaginative, depiction of Samuel the Lamanite preaching to the Nephites. Upon closer inspection, these parallels begin to fall apart. First, what Runnells doesn’t tell us is that the passage in question from View of the Hebrews is in reality quoting an incident recorded by Josephus (Wars 6.5.3). In this account, Jesus son of Ananus is depicted as an apocalyptic prophet of sorts (such were common at the time, and Jesus of Nazareth himself has been categorized as such by many New Testament scholars) foretelling the destruction of Jerusalem by the Romans in the first century AD. Josephus depicts Jesus as a Jewish “plebeian and a husbandman” who caused a ruckus for “seven years and five months.” Contrast this with Samuel, who is depicted as a Lamanite outsider coming into the “land of Zarahemla” and merely preaching for “many days” before he was tossed out by the people (Helaman 13:2). Only when God commands him to return does Samuel go “upon the wall” of the city because he had been barred entrance (Helaman 13:4), unlike Jesus, whom Josephus reports “went about by day and by night, in all the lanes of the city.” Only at the end of his life and ministry did Jesus go “upon the wall” of Jerusalem to preach during a break in the Roman siege. It was at this time, Josephus says, that Jesus was killed by a stone (not “stones” as Runnells claims) hurled by a Roman siege engine, not an angry mob. 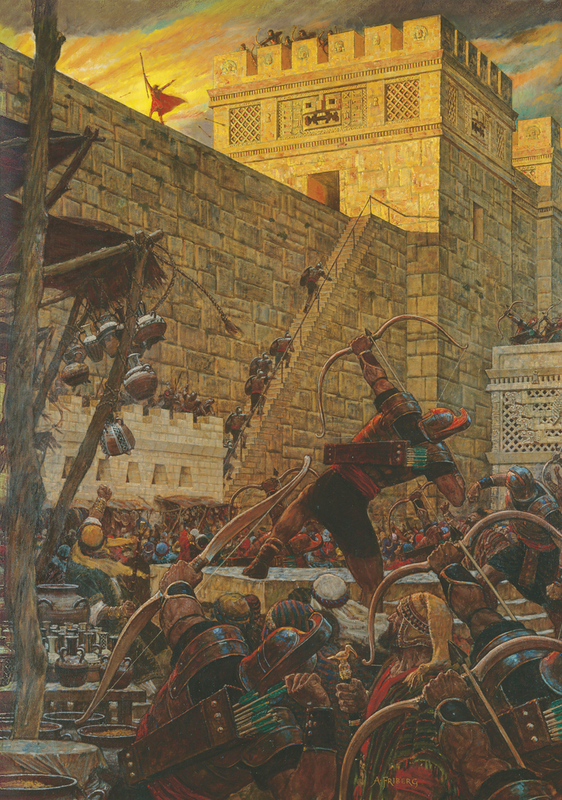 In Helaman 16 “many” Nephites, fed up with Samuel, threw stones and arrows at the prophet and sent foot soldiers to capture him (Helaman 16:2–6). Unlike poor Jesus, Samuel escapes “unto his own country” and is never heard of again (Helaman 16:7–8). So Ethan Smith wasn’t inventing a fictional character. He was actually referencing an ostensibly historical figure from 1st century Palestine who did basically the same thing as Samuel the Lamanite at basically the same time, only for much longer: cry doom against the people. Jesus and Samuel were merely following the venerable Israelite tradition of Jeremiah and other Hebrew Bible prophets who did the same thing in their own respective times. Thus, far from being detrimental to the Book of Mormon, this actually shows the Book of Mormon is rooted in the same ancient prophetic tradition that spanned Israel’s history from Jeremiah in the 7th century BC to the time of Jesus Christ in the 1st century AD. But we’re not done yet. Let’s look closely at what Runnells says about a supposed word-for-word parallel between the two texts. Runnells claims Helaman 13–16 has Samuel saying “‘Wo, wo, to this city’ or ‘people’.” Actually, Runnells is misquoting the Book of Mormon. The Book of Mormon (Helaman 13, 15) never actually says “Wo, wo to this city” or “this people” as Runnells says it does. It does say: “wo unto him that repenteth not” (13:11),”wo unto this great city of Zarahemla” (13:12), “wo unto this great city” (13:12), “wo be unto this great city” (13:14), “wo be unto the city of Gideon” (13:15), “wo be unto all the cities” (13:16), “wo unto this people” (13:24), “wo unto them which are with child” (15:2), and “wo unto this people” (15:3) in a long string of prophetic pronouncements. This may seem like a trivial thing, but it actually demonstrates that Runnells is playing fast and loose with the Book of Mormon. It never once says “wo, wo to this city” or “wo, wo to this people” in the passages from Helaman that he cites. What’s more, proclaiming “woe” unto people, individuals, cities, etc., is a common phenomenon in the ancient prophetic tradition of biblical Israel (Ezekiel 13:3; 16:23; 24:9; 34:2; Nahum 3:1; Jeremiah 4:23; 6:4; 13:27; 23:1; 48:46; 50:27; Isaiah 3:11; 17:12; 18:1; Zephaniah 2:5; 3:1). As such, we need not assume that the Book of Mormon’s depiction of Samuel the Lamanite proclaiming “wo” to cities and peoples in the land of Zarahemla is cribbed from Ethan Smith. It’s in the Bible, and could have persisted in the Nephite prophetic tradition just as it did in the Israelite/Jewish prophetic tradition clear up until the time of Jesus of Nazareth (Matthew 11:21/Luke 10:13; Matthew 23:13–14, 23–27/Luke 11:42–47; Revelation 8:13; 12:12). Finally, for added measure, people going up on walls to do important things is also depicted in the Hebrew Bible. The dedication of the reconstructed walls of Jerusalem was accompanied by public commemoration “upon the wall” (Nehemiah 12:27–31), while the king of Moab offered his son as a “burnt offering” upon a wall when he saw things were going south in his fight against Edom (2 Kings 3:26–27) and a certain Aramean king swore a public oath against Elisha “upon the wall” when he lost his cool (2 Kings 6:30–31). Thus, in this instance essentially all of the parallels we encounter in the Book of Mormon and View of the Hebrews come from the world of the Bible. One can therefore easily look at this evidence and see the Book of Mormon as accurately reflecting the world of ancient Israel, as opposed to plagiarizing Ethan Smith. What is thus a supposed mark against the Book of Mormon is actually evidence for its antiquity. Stephen, brilliant exposition! Bravo, brother, bravo! I've read view of the Hebrews myself and I really don't see much similarity between it and the Book of Mormon. The book is basically a list of evidences that the Native Americans are descendants of the lost 10 tribes which includes biblical or apocryphal texts that are cited to prove his point. True there are some parallels, but I think the similarities are completely overrated. If critics are trying to find a secular orgin, this is definitely not the source. I largely agree with this assessment. Thank you for pointing this out. I too have read the entire VOTH and it's clearly nothing you can plagiarize from. HOWEVER, read pages 61,145,150,152,154 and 155 (these are the digital pages from the Google book edition which is free to read on any device or computer) and if you can still look at me with a straight face and claim that Joseph Smith wasn't inspired by that your crazy. Especially when you take notice of the publication date on the title page,(1823) the same year that Joseph claims he started having visits by the "angel Moroni". He answered the call of Ethan Smith "who among you in all of Columbia (America) will help bring these natives to a knowledge of their forefathers as remnants of scattered Israel and fulfill the prophecy to unite the stick of Judah and with the stick of Ephraim and make it one stick". It's all in their folks. Just take the time to read it. So are you saying that because parts of View of the Hebrews reflect Biblical ideas, if we see the same Biblical ideas reflected also in isolated segments of the Book of Mormon, this validates the accuracy of the Book of Mormon? How does Ethan Smith's relying on some of the same Biblical ideas that JSJr relied on validate the Book of Mormon? That two separate people graft some of the same parts of the ubiquitous Bible into their separate novels, how does either validate the other? If Ethan's doing so somehow validates the Book of Mormon, does JSJr's doing so reciprocate and validate View of the Hebrews as accurate? Or are you implying that Ethan Smith too was a prophet of Mormon god and that View of the Hebrews is also "god's word"? Excellent! Having read "View of the Hebrews" some years back, I find any attempts to compare it with the Book of Mormon to be preposterous. The thing apologists seem to fundamentally misunderstand about the Letter to a CES Director is that it is not an authoritative source, nor was it ever intended to be such. It is a LETTER to a CES DIRECTOR. He was writing his concerns in hopes that said CES director could provide a response. No response ever came. The proper response to Mr. Runnells would be to acknowledge his concerns as legitimately concerning, provide alternative viewpoints, and express empathy. Unfortunately, Mormon apologists attack him instead, thus further widening the gap of understanding. This is just more evidence that Mormon apologists aren't very Christian. The real problem with VOTH and the BOM is that they are from similar genres: pseudo-Biblical texts from the 19th century. There are many other books that fit in this genre (The Late War, The First Book of Napoleon, etc.). It makes the BOM a lot less impressive when you see that it's just one of many "teeming with semitic complexity, chiasmus, and other evidences of antiquity" (which is hilarious given the frequent switch apologists make between loose and tight translation theories). But way to demolish that straw man! Keep up the great work! If the Director of CES gave a detailed point by point response to said letter would it cause you to return? Not likely, considering most of what's in the letter is factual, as acknowledged by FAIR. I assume that's why he didn't respond: because the answers are not good news. So why even complain about a lack of an official response since you just admitted it would make no difference to you whether one came or not? So there is no reason/value to study out answers and respond unless you get Jeremy to return to the fold?